Working Speed (products/hour) 480 Books/Hr. This machine can be operated by one person. It is possible to glue with cold vinyl glue by enabling the application of glue on different materials. The glue tank is easily detachable for cleaning purpose. 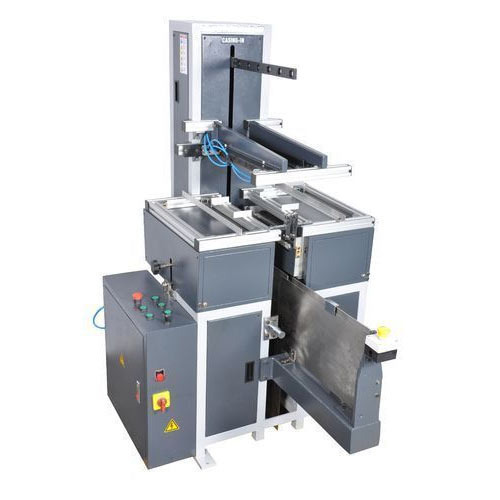 This machine is specially designed with automatic book feeding unit and book registration with even glue coating of wrappers and also the book is done with free calendaring. We, Druck and Bindung Machinery Corp., started our business operations in the year 2010, are instrumental in exporting, importing and supplying a wide assortment of the handpicked quality of equipment like Hardcover Book Binding Machine, Perfect Binding Machine, Rigid Box Making Machine, Paper Straw Making Machine etc. We have already established our flagship brand MEGABOUND, for which we act as dedicated North India & Export Wing, as one of the most successful Hard Case Binding & Perfect Binding Solution along with Rigid Box Making Solution Providers on Global Scale with our footsteps almost in every continent. Megabound Range of Hard Case Binding Machine is arguably the top-notched world leader with the most competitive cost in such category of high-quality binding solutions. We are the EXCLUSIVE India Representative of Gaosheng Fully Automatic Splicing Box Making Machine from China. We are now offering our in-house premium product High Speed CNC Paper Straw Making Machine and Automatic Card Cutting Machines under the brand name D&B. We offer the most advanced equipment and the production process. We offer one of the widest range of automatic business card cutter. To satisfy different demands of our customers, we are keen on customizing and tuning products to satisfy our clients and fit into the competitive markets. Known for their performance, design and energy efficiency, these products are available with us in various technical specifications. These are delivered within promised and stipulated time frame, due to our logistic support professionals who make use of wide and well-connected distribution network. For ensuring utmost and highest standards of quality, these products are manufactured under our well-streamed supervision by using modern machinery, to ensure high standards of quality. Highest Global Quality Standard at the Most Competitive Cost!